A Republican is trying to inject some budget sanity into Congress. Will it take? In Virginia beach a few weeks ago, at the start of my recent road trip, I was staggered by an unexpected blast of political sanity. It came in the person of Scott Rigell, a freshman House Republican. Rigell had signed the ghastly Grover Norquist no-tax pledge when he ran for office in 2010. Once elected, Rigell began to wonder about his vow never to vote for a tax increase. He did some research into the past 50 years of taxing and spending--and then he publicly reneged on the pledge, receiving a squalid earful from Norquist in the process. Rigell's calculations form the basis of what should be a new slogan for the sane center: 20/20 FORESIGHT. In his Virginia Beach office, Rigell, 52, pulled out an easel and magic marker and showed me how he'd come to his conclusion: "You have to see it in context," he said, writing "'Bush' tax cuts" on the board. He put Bush in quotation marks because he didn't like using a President's name pejoratively to describe a program. He insisted on calling Obamacare by its proper name: the Affordable Care Act. Anyhow, he wrote "16.9%" on his pad. "That's our average revenues as a percentage of gross domestic product over the past 11 years, and it's a good firm figure. It includes good years and bad ones." Revenue was up to 18.2% of GDP at the end of the housing bubble in 2006 and down to 15.1% after the Wall Street bust. "Now can you tell me the last time we ran a government with 16.9% revenues? 1959. Before Medicare and Medicaid." He flipped another sheet of paper on the easel and wrote two big numbers, the historical averages for revenue and spending for the past 50 years: 17.9% revenue, 20.5% spending. "Our current rate of spending is 24%, which is very high, given the historical context." 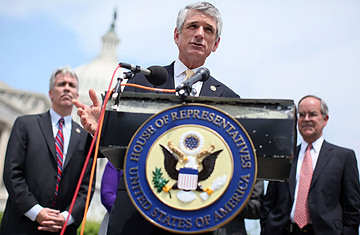 Rigell acknowledged that revenue may increase when the economy begins to grow and that current spending levels may be slightly bloated both by the Obama stimulus and a range of benefits for the unemployed. Indeed, he seemed to make it a matter of personal honor that he included every nuance. Our meeting lasted more than an hour as he laid it out. The top line was the range of spending numbers. The second line was the revenue numbers. Rigell ran on 18% spending, he said, would hope for a balance of 19% spending and revenue, but could be dragged kicking and screaming to 20%. (Buffett was in the 19%-to-20% range for revenue and 21% for spending; I'd be a bit higher.) Now, obviously, this was a broad-brush calculation--and it elided a major philosophical difference between liberals and conservatives: whether government should increase spending to goose a dormant economy during a recession. But 20/20 did seem to be the basis for a reasonable discussion of a long-term deficit deal. The trouble, of course, is that there is a yawning void of reasonable discussers in the House of Representatives.